Dancing New Year's Eve CT is the best dancing New Year's Eve party in Connecticut! 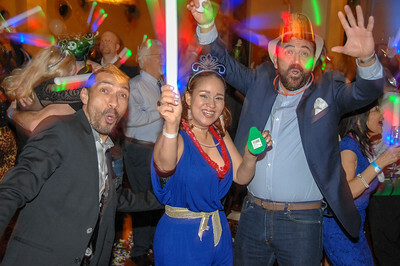 It combines free beginner dance lessons in Salsa, Hustle, and West Coast Swing; an elegant buffet dinner; open bar; and fantastic party with a Champagne toast at midnight in one of the premier hotels in Stamford, Connecticut. See the full schedule of Dancing New Year's Eve CT. This event is perfect for singles, couples, friends, and even family! Dinner and dancing is a great way to meet new people and hang out with your friends. If you are new to the dance world, consider this evening to be your welcome party! Even if you are not a dancer, you'll have a great time enjoying the excitement that a New Year's Eve party can bring. See our registration page to begin your 2019-2020 celebration into the new year. This New Year's Eve party will be held in the Grand Ballroom of the Sheraton Stamford Hotel located at 700 East Main Street, Stamford, CT, conveniently off of I-95 (Exit 7) and close to the Metro-North station. Easy to get to—then stay overnight, without a worry! Reserve your hotel room early because the hotel sells out quickly. See our hotel information and use our reservation Code. It's New Year's Eve!! The evening will be Semi-Formal. Please dress with style. It's your party—make it awesome! !